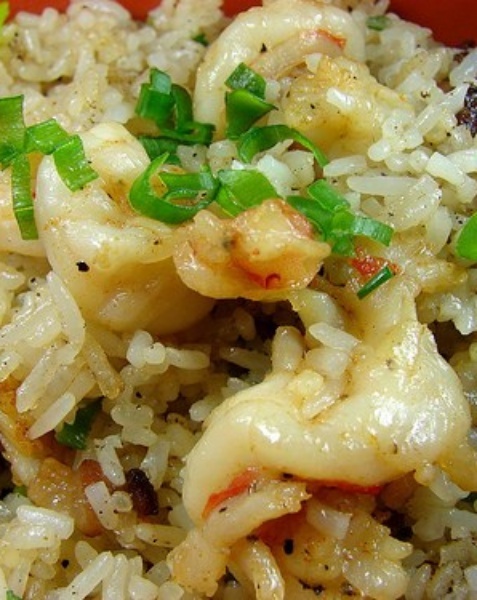 It’s almost like a fried rice, except you fry the rice in butter and add a generous amount of garlic. I had some leftover steamed rice from my delivery order of Chinese food, and that’s what I used. I opted to slice the shrimp in half, lengthwise. Not sure why, but that’s what I did. Season the shrimp with the paprika, salt and pepper and set aside. In a medium-sized pan, cook the bacon until crisp. Add the shrimp and cook them for a couple of minutes just until they don’t look translucent. Add 2/3 of the green onions. Remove the shrimp and bacon from the pan with a slotted spoon, leaving the bacon fat behind.